In a network of immediate communication and images, I find myself more often than not being reticent to share my latest meal or endeavors anywhere on the digital networks that are at our fingertips. I’ve just gotten back from traveling for three weeks with twenty Juniors from my University, to various lovely locations in France and England. Not once did I tweet or post an image or report what I was seeing or doing. I’ll own in a sense it was an act of rebellion because everyone else was. By the end our adventure 300 photos were posted on our Facebook site and students had disposed of or downloaded numerous photos to various clouds of sharing often on a daily or moment-by-moment basis. Traveling with a group of students has its nuances. Walk down a street in Beaune France, pause to enjoy looking at something. Take out camera. Take a photo; -flash- four to six students are surrounding you, jockeying for position to photograph the same thing. I don’t know. I do like them (or I wouldn’t take these trips) and maybe this is a way I can to help them see things. And yet, I’ve seen too much vacuous photo shooting watching individuals in a somewhat gluttonous manner photograph item after item in a museum, never really looking at anything they are photographing, simply walking on once they “have” the image. I found myself grumbling in the Musee d’orsay a little over a week or so ago, “Stop and look at the damn painting….” Rather than really experiencing the object or work, it becomes an image in a digital collection that has a high likelihood of never being thoughtfully looked at again. What comes to mind is thoughts from The Shallows by Nicholas Carr; we are using digital technology to externalize our brain rather than actually knowing these actual things and internalizing them. 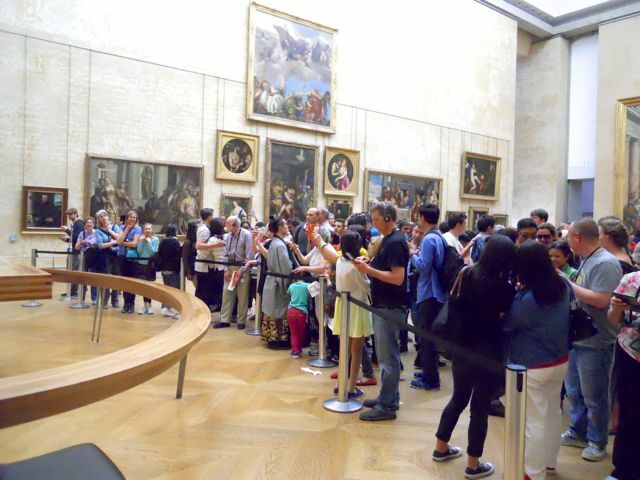 Yup what you’re looking at is the crowd of people in front of the Mona Lisa in the Louvre. How many folks are really looking? And are there crowds like this in front of the other DiVinci pieces just a room away? n. The frustration of photographing something amazing when thousands of identical photos already exist—the same sunset, the same waterfall, the same curve of a hip, the same close-up of an eye—which can turn a unique subject into something hollow and pulpy and cheap, like a mass-produced piece of furniture you happen to have assembled yourself. I have done an exercise with my classes where I will take them somewhere where I know they have spent time looking previously, like one of the art galleries on campus. I will have three students face the rest of the class, and simply ask the three to, without turning around, tell me everything that is on the wall behind them. What I always find curious is what students remember: dramatic items, people, items that are unusual or out of the ordinary, and what they don’t remember: things that to them weren’t important to look at or for like wall plugs, subtleties or items we have learned to visually skim over. Perhaps my hope is if more internalizing of what we look at would happen, we’d be a bit more thoughtful in what we create, and understand a bit more thoroughly what we are looking at in the first place. We can try to document everything we see, without ever really understanding any of it. And a 360 of the room of Pre Raphaelites in the Tate in London. Certainly lots to look at here. This entry was posted in Culture (as best as we are able) and tagged looking at something, looking at the mona lisa, photographing in museums, the art of looking, the dictionary of obscure sorrows. Bookmark the permalink. 1 Response to Did You See That? Sometimes I put my camera down for the same reason- but then I worry that I may have missed that moment I needed to capture. So I breathe.